True story: my good friend and one of the sweetest, funniest ladies ever - and I know this for a fact because I just spent a great week with her in Rhode Island - is having a birthday today. Everyone deserves to have a great day on their birthday so if you get a chance please click on over to Scrappin' With Life and tell Callie Ann that I sent ya and you want cake! Or at least pie; pie is good, too! Happy birthday, CallieAnnBrat, and may all of your fondest wishes come in on the next wave! Sadly, my fervent wish that there would be no more Line of Duty deaths in September was not to be after a tragic crash of a Maryland State Police medical evacuation helicopter on Sunday, September 28th, claimed the lives of four people including two Maryland State Troopers, a Charles County emergency medical technician, and one of the two patients that were being transported from the scene of an accident in southern Maryland . The crash occurred sometime after 12:30 a.m. in a park near Capitol Heights , Maryland when the medical helicopter encountered bad weather. A massive search for the helicopter was launched after air traffic controllers at Andrews Air Force Base lost radio contact with the crew; local, state, and federal authorities helped in the search. Using technology to track signal from the crew's cell phones, the search was narrowed down to an area near the Walker Mill Regional Park in Capital Heights . At approximately 2:00 a.m. an officer spotted the crash site deep inside the 470-acre park. Killed in the crash was the pilot, Stephen H. Bunker, who had been with the Maryland State Police since 1972 and flown with them for more than 24 years. Pilot Bunker was a State Police corporal who had retired in 1998 and then returned to service as a civilian pilot. He held a commercial pilot's license and was a certified flight instructor and a certified instrument flight instructor. In addition he also had a single engine airplane pilot's license. Mr. Bunker is survived by his wife and three grown children. Trooper 1st Class Mickey Lippy, the flight paramedic on board, was appointed to the Maryland State Police four years ago. He had been in the Aviation Command as a flight paramedic since April of 2007. Trooper Lippy was married and had recently returned from family leave after the birth of his daughter who is 4 months old. Maryland State Police, which flies medical helicopters in the state, say this is a devastating loss for the agency. "They save lives every day, but they also take that risk when they get into that helicopter," said Greg Shipley, public information officer for Maryland State Police. "There's always a certain amount of risk and these are brave men and women who go out and do this every day." Colonel Terrence Sheridan, superintendent of the Maryland State Police characterized the crash as the worst in the history of the police department. "This is a devastating tragedy," he said. "We have had crashes before but never with four dead. This is the worst." The crash was the deadliest in the 47-year history of the Maryland State Police aviation unit, and the department's first in more than 22 years. Also killed in the crash was Tanya Mallard, an emergency medical technician with the Waldorf, Maryland , Rescue Squad who leaves behind her husband and two children; and patient Ashley Younger, 17. Another patient survived the crash and was hospitalized in critical condition. Remember how awhile back I said that my schedule was changing at work and that I would be working less hours? Yeah, well, scratch that ... my schedule changed yet again at work and I am now working even more hours (56 a week to be exact; at this rate I'm going to need to start taking Phentermine to give me a little bit of an energy boost!). You folks enjoy the waves while I head back into work just 8 hours after I left work last night. This is truly becoming a vicious cycle! I don't know who these folks are and, frankly, didn't even remember taking this picture when we were at the National Seashore on Cape Cod as part our vacation but when going through my pictures I came across it and thought - yep, that's what life should be like right there - walking hand-in-hand on the seashore with the one that you love while seagulls circle overhead. I'll be sitting over in the corner now ... sobbing. Everyone else have a great Sunday! September has been a truly horrible month for law enforcement with more line of duty deaths then I care to count. As I add these last five fallen officers to my sidebar, I can only hope that this is it for September at the very least and it would be really, really, really nice if that included the rest of the year, too. Please join me in offering thanks and condolences for these men and women who gave all to their communities. Sergeant Michael C. Weigand, a part-time sergeant with Latimore Township Police Department and full-time patrolman with Eastern Adams Regional Police Department died in the Line of Duty on Sunday, September 14th during a Blue Knights benefit ride to raise money for Latimore Township Park. The 2000 Kawasaki police motorcycle he was riding was hit by a Ford F-250 when it lost control and skidded across the road striking and killing Sergeant Weigand on the scene. Sergeant Weigand, age 25, is survived by his wife Amanda, and three-year old daughter, Lanie. 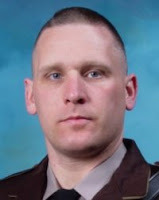 Detective Tommy Keen of the Harris County Sheriff’s Department in Texas succumbed to injuries sustained on Saturday, September 13th while assisting with recovery efforts following Hurricane Ike. While on his way into work his way was blocked by a fallen tree so he returned to his home to change out of his uniform, get a chainsaw, and clear the roadway. "He had already notified the dispatcher that he was on duty," said Capt. John Martin, a sheriff's department spokesman. "He was just determined to get to work." As Detective Keen cut the tree, a branch lying against a high-tension wire suddenly shot into the air and struck him in the head. He was taken to Ben Taub General Hospital where he died from his wounds on Monday, September the 15th. How much more devoted can you be to your job?" said sheriff's Major Juan Jorge. "On a day when everybody wanted to be home with their family, he literally lost his life trying to get to work. He was just a prince of a guy," Jorge said. "Nobody could ever say anything bad about him." Detective Keen, who was scheduled to retire at the end of October, was a US Army veteran of the Vietnam War and had served with the Harris County Sheriff's Department for 35 years. He is survived by his wife and adult son. A U.S. Forest Service officer was fatally shot Saturday, September 20th, while making a traffic stop of a man who investigators suspect had also killed the owner of the pickup truck he was driving when later captured. Officer Kristine Fairbanks, 51, a canine officer with the forest service radioed dispatch at 2:22 p.m. and said she had stopped an old Dodge van without license plates near the Dungeness Forks campground in Olympic National Park. When a dispatcher tried to contact Fairbanks with information on the driver, there was no response and troopers and a sheriff’s deputy were dispatched. The deputy arrived first, at 3:10 p.m., and found Fairbanks dead. Her police dog, Radar, was unharmed in her vehicle. “She was a very positive, very dedicated employee,” said Cynthia Bork, Forest Service spokesperson. As of 2007, Fairbanks was the only Forest Service officer in the state with a K-9 partner, and one of only 40 in the United States "She was considered one of the best K-9 handlers, if not the best," Bork said. A 15-year veteran of the Forest Service, Officer Fairbanks is survived by her husband, Brian, a Fish and Wildlife officer; her 15-year-old daughter, Whitney; and her father, John Willits of Port Angeles. Caldwell County Sheriff's Deputy Adam William Klutz, 25, died from wounds received after he was shot in the head Friday, September 19th, while responding to a 911 hang-up call at a local home. Deputy Lt. Chris Martin, who arrived after Klutz, was shot three times in his bulletproof vest and suffered minor injuries. Investigators believe that Deputy Klutz was gunned down as he exited his vehicle after arriving on-scene. The suspect then shot Deputy Martin before fleeing on horseback. The suspect’s body was found five days later on September 24th dead from what appears to be a self-inflicted gunshot wound. "We're very saddened by the death of Adam Klutz," Caldwell County Sheriff Alan Jones said. "We ask that the citizens of our community pray for Adam and his family during this difficult time." Deputy Klutz had served with the agency for one and a half years. He had previously worked at the Caldwell Detention Center for approximately one year and had served three months with the Hickory Police Department. He is survived by his parents. Highway Patrol Officer Patrick McDonald, 30, an eight-year police veteran and the second Philadelphia officer to be killed in the line of duty this month and the fourth this year was gunned down on Tuesday, September 23rd shortly after making a traffic stop on a vehicle whose passenger was a violent felon and wanted man. Upon asking for identification, the passenger fled the vehicle and was pursued a short ways on foot by Officer McDonald before the suspect turned on the officer and shot him several times. While Officer McDonald was on the ground, the suspect then stood over him and shot him several more times. Another officer, Richard Bowes, was shot n the leg before the suspect was killed by other responding officers. Officer McDonald was rushed to Temple University Hospital, where he was pronounced dead at 2:08 p.m., 23 minutes after he had radioed for backup. A popular officer with the traffic division, Officer McDonald was the son of a retired Philadelphia Fire Department captain. His girlfriend Joanne Heary - a police officer in the Northeast's 15th District – said of McDonald, "He's very dedicated to Highway Patrol. He came out and did his job. He loved the motorcycle, the 25th District . . . Everything he did, he gave it his all." After spending the day before exploring Block Island, Wednesday seemed like a good day to just kick back, relax, and do our own thing at the beach house. After all, isn't that what vacations are all about? Relaxing, enjoying, and eating way too much? I sure hope so because I'm guilty on all counts! While Mags relaxed on the deck reading her new book that she had picked up that morning after getting her hair cut and Callie, Mo, and Kai paid a visit to the local laundromat (okay, so that's not exactly having a good time but it was necessary!) Claire and I took a drive over to Wakefield so that I could fill up my car with slightly less expensive Rhode Island gas, Claire could raid a local ATM to get more money to contribute to the economy, and I could find the ingredients to whip up a batch of apple crisp for desert. Knowing that we were very close to Point Judith and wanting to take a few more pictures of the lighthouse on a bright, sunny day I pointed the car in that direction and soon Claire and I found ourselves walking out on a rock jetty that was just south of the lighthouse. Hopefully Claire won't mind that I post this picture of her walking along the rocks; even though you can't see her smiling face, trust me - that is her! Unlike Claire, the seagulls in the area were quite willing to pose for pictures so in addition to pictures of the seashore, I was able to capture some shots of the local "residents"! Finally dragging ourselves away from the beautiful seashore, Claire and I headed back towards Matunuck with one more stop on our agenda at the local farm stand that was just down the road from our beach house. Having driven by it numerous times we knew that there were some beautiful fall mums and pumpkins to take pictures of plus I needed to get some Cortlands for that apple crisp I had promised everyone! Upon arriving back at the house we found Mags still reading out on the deck, Kai relaxing right along with her, Mo having himself a nice nap, and Callie just waking up from hers. Sounds like the perfect way to spend a day on the shore, doesn't it? Before I knew it, the sun was starting to go down and I set up my tripod to take some lovely shots of the sunset - I'll post more of those later! Later, I was ready with my camera at the ready once again to try to catch some of the beauty of the night as the moon rose over the roofs of the beach houses near us. All in all, it was a beautiful day and a great way to spend the mid-way point of our beach house vacation. 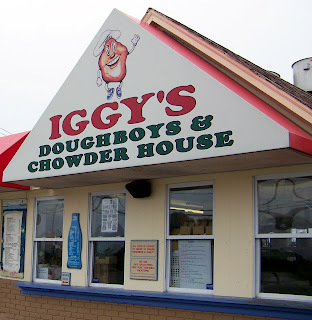 Oh, and I guess I should come clean and add that while Claire and I were in that area we snuck back to Iggy's for a small cup of the best chowdah on the East Coast! Our bad but it really is very, very, very good! After I win the lottery I'm finally going to stop being a renter and buy a house of my own. More precisely, I'm going to have my son who took architectural drafting in tech school design a house for me and then I am going to have it custom-built on Block Island, a place I had never been to up until I took the ferry there during the course of my vacation. 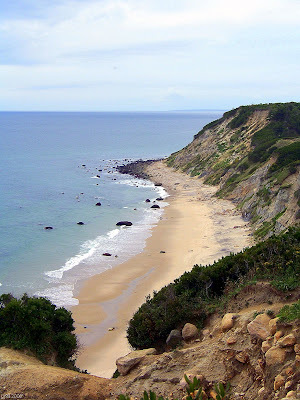 Block Island is part of Rhode Island and sits about twelve miles south of the coast out in the Atlantic Ocean. Some people have compared it to Ireland because of its rolling green hills and dramatic bluffs and it's even been listed as one of the "twelve last great places in the Western Hemisphere" by the Nature Conservancy. Heck, all I know is that it's beautiful and that someday I'm going back to spend more time there even if I have to go by myself! Living in Connecticut, I'd heard a lot about "The Block" - especially considering there are ferries that leave from New London bound for there every day in the summer - but I had never had the opportunity to go out there myself. When we were planning our beach house vacation I mentioned it as a possible destination as the ferry that leaves from Point Judith was only about 10-15 minutes from where we were staying on Matunuck Beach. Everyone else thought it was a good idea so on Tuesday we piled in the van and caught the 10:00 ferry for the 55-minute trip out to the island that we could see in the distance from the back deck of our beach house. The day was a little overcast but the seas were calm as the Carol Jean set out so it was a very pleasant ride. Kai and Claire did what Canadians and the English do best when they go on holiday - toasted the occasion with a beer or two - while Callie listened to her iPod and I took probably way too many pictures! All in all it was a very nice crossing and we arrived on Block Island ready to find something to eat and then do some exploring. My supervisor at work had suggested the Mohegan Cafe as a good lunch destination so that's where we went and I had a very tasty Burlington Burger which had a nice slice of Vermont Cheddar Cheese on it. Bad blogger that I am, I neglected to take any pictures of my lunch but I'm sure you all know what a hamburger looks like! 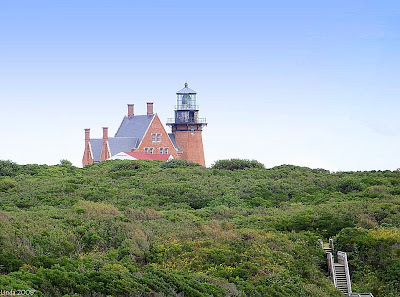 Block Island is not quite 10 square miles so there are several good options for going to see the sights - which includes two historic lighthouses and beautiful landscape. You can either rent a bicycle or a moped, be in really good shape and hike, or do what we did - hire a taxi van to take you on a one-hour narrated tour. This was a really great way to see the island as our guide was quite knowledgeable except for one small problem - the small van! 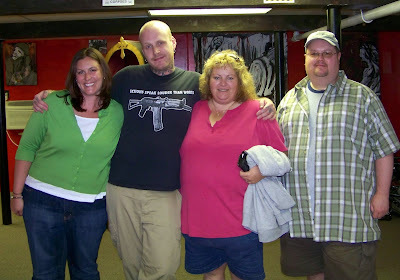 Now as you can tell from the pictures we've all been posting about our vacation, none of us are exactly skinny-minny (even though Claire and Kai are by no means big) and trying to stuff the six of us into a regular size mini-van wasn't exactly easy. Mo has bad knees so he sat up front with the driver, Mags and Callie took the middle seat, and Claire, Kai, and I made like sardines and squeezed into the back. And please believe that I do mean squeezed! This arrangement worked okay except that whenever we stopped along the way to get out like at the North Light and the Southeast Lighthouse I had to make like a contortionist to get myself in and out of the back of that van! Honestly, someone should have taken a picture of that or even better would have been a video of me trying to get in and out without messing up my back or squishing Kai even worse than I already was! We laughed about it a lot so I guess it wasn't that bad but next time I'm out there, I'm renting myself a moped and seeing the island that way! One of the highlights of our tour was a stop at Mohegan Bluffs which are on the southern side of the island facing New York. 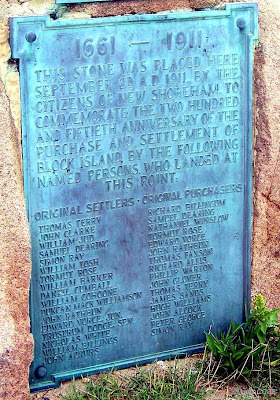 The Bluffs are the site of a battle between the invading Mohegan Indians (yes, the same ones who own the Mohegan Sun Casino down the road from me), and the native Manisee Indians of Block Island. During the battle the Mohegans were driven off the edge of the tall cliffs to their deaths on the beach some 200 feet below. The only way to get down to the beach now is to climb down a wooden staircase that has 141 steps and then climb over the large rocks that are at the foot of it. 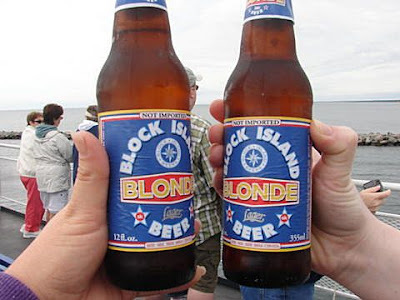 That's on the agenda for my next trip to Block Island! At the top of Mohegan Bluffs is the Southeast Lighthouse which Mo really wanted to see as it's on his list of Most Beautiful Lighthouses. Kind of easy to see why, isn't it? The lighthouse was originally constructed in 1875 and when it was dedicated President Ulysses S. Grant attended the lighting ceremonies. Originally the lighthouse was placed 300 feet from the edge of the Bluffs but due to constant erosion it was necessary to move it back 360 feet in 1993 to keep it from tumbling over the edge. The station was built in the Victorian Gothic style, has a tower that is 67-feet tall, and it's green light can be seen for 22 miles. In 1997 it was designated a National Historic Landmark and in the summer months one can go on a tour of the house and the tower. Unfortunately we were there in the off-season and could only walk around outside of the lighthouse but even that was very, very impressive. Block Island has a second lighthouse called the North Light but it is currently undergoing restoration and was closed though we were able to see it from a distance. Our tour guide said it was supposed to be reopened in mid-September but there were delays, which often happens when restoring a building that was originally built in 1884. The lighthouse that currently stands at the Northern tip of the island is the fourth lighthouse built on that site; the original one was built in 1829 but was threatened by the ocean, the second one caused more shipwrecks than it prevented, the third one was again threatened by the ocean, and finally the fourth one - made of granite and iron - became the beacon that guided mariners away from the dangers of Sandy Hook which extends about a mile or so from the island. 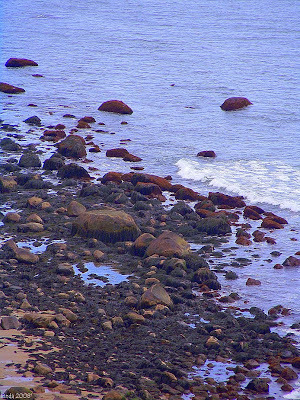 Block Island is known for its dangerous shoals and frequent fog which caused 59 vessels to be wrecked on or near it between 1819 and 1838. Obviously two lighthouses are needed! In addition to the lighthouses and the beautiful landscape, Block Island also has some lovely old Victorian Inns and Hotels that add to the overall charm of an island that goes from a population of about 1,000 in the winter to close to 10,000 in the summer. I could certainly do without the dramatic increase in population in the summer but otherwise I could happily see myself becoming a resident and enjoying the peace and quiet of island life. Too bad they don't need a dispatcher! After spending the remainder of our day walking around some of the shops that were still open in spite of it being past Labor Day or checking out the rest of the local scenery, we caught the last ferry back to the mainland at 5:00 and bid Block Island a fond adieu. The trip back was just as lovely as the one going out and afforded me the opportunity to take the pictures that I used in yesterday's post. Overall I thought it was a great day and I was very glad to have gone and finally had the opportunity to see a place I had heard so much about but never had the chance to see in person. Like I said, I'm definitely going back one of these days to hole up in a quaint Victorian inn, tour the island via moped, and revisit the two lighthouses. Not too worry, I'll be sure to take lots of pictures! And now to go buy that winning Powerball ticket so Mike can start designing my new house! Yesterday morning at work we had The Today Show on in the background for awhile and I heard the stupidest thing ever - PETA had sent a letter to Ben & Jerry's requesting that they use human breast milk rather than cow's milk in the making of their ice cream. HUH?!? Of course being the sick individuals we are at work we naturally started joking around about having stalls of women hooked up to milking machines! Thankfully the wiser people at Ben & Jerry's thought it best to leave human mother's milk for human babies and continue on with business as normal in Vermont. Where do people come up with these ideas?? One of the guys I work with who recently became a paramedic has also recently started a blog of his own. Rob has been a regular commenter on my blog for some time now "and decided that since I used to blog, there is no reason that I shouldn't blog again!" Of course, I only found this out as he is listed as one of my blog followers and I went to go check it out. 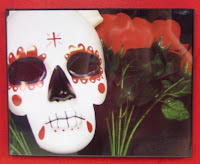 I'd appreciate it if you'd click on over to Rob's Random Ramblings and welcome Rob to the Blogosphere! He leaves great comments so I'm sure he's going to write a great blog once he gets past that first post he has up! It's going to rain here in Connecticut for the next two days and even if I didn't hear it on the weather forecast, I'd feel it in my back and left leg which has been aching like nobody's business since yesterday. I tell ya, being a walking barometer is really not all that fun! My friend Mags got a phone call from her mother yesterday that her father was having some chest pain and difficulty breathing and then she got another call this morning that he is scheduled for bypass surgery tomorrow. She's on her way here to Connecticut to be with him. I know you guys are good at this so please send thoughts, prayers, and wishes her way for her Dad's successful surgery and recovery. Claire is flying back to England today from Boston and I am really going to hate her being so many, many miles away. She may come across as a cheeky little Brit on her blog (and trust me - she is!) but she is also one of the funniest, warmest, nicest people I've met even if she hates having her picture taken even more than I do! She has told me she's planning her next visit again already and I sure hope so as I would love to see her back here! I'd also love to go visit her in England as she told me so much about it but unless I manage to win that elusive Powerball jackpot, it may be a very long time before I can afford to go. 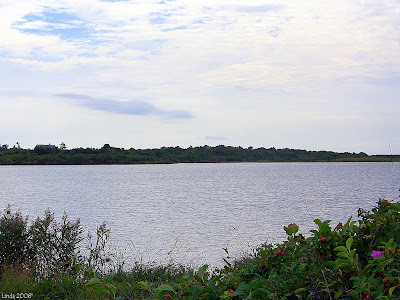 Finally, if you're curious about all of the pictures in this post, they were taken from the upper deck of the ferry that was returning us from our visit to Block Island back to Point Judith on the Tuesday of our vacation. You guys know me and pictures of the sky and clouds and if you throw in the ocean - I just can't resist! I thought this was a good way to share some of them. 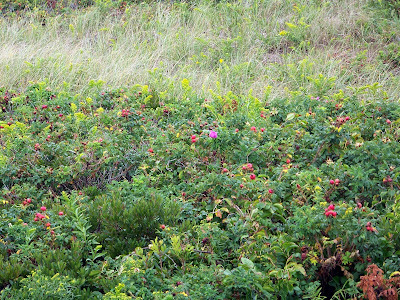 More on Block Island in another post soon! Everyone have a great Thursday no matter where you are or what you're doing! Even though last week was a lot of fun for me there were also a few moments of sadness as despite allegations that I am cruel, heartless, and a handful of other non-complimentary adjectives I really do have feelings and things happen that can make me sad. In this case it was the death of Amanda's newly adopted leopard gecko Elektra. Just prior to our leaving the house on Saturday to head out to Rhode Island, Claire called for me to come quickly into the dining room where the lizards live as she had found Elektra lying on her back on top of her cave looking for all the world like she was dead. Despite the fact that I'm not a major fan of reptiles, I still felt terrible for the poor little thing and felt even more horrible as I called Amanda who was out with Jason, Amy, and Cate to tell her the news. Amanda was pretty quiet at first but then said that she wasn't too surprised as Elektra hadn't been eating and was horribly small for her age. Still, it hurts when you lose a pet no matter how long you've had them or what kind of pet they may be. I wasn't really sure I wanted to pick her small little carcass up so Claire offered to remove her from the habitat for me but as soon as she touched her, Elektra moved and rolled back onto her stomach. Still, she looked like she wasn't long for the world so I called Amanda back, gave her the update, and tried not to dwell on the fact that Amanda was very likely coming back to a dead pet on Sunday. Sure enough, I got a phone call Sunday morning letting me know that Elektra had passed on. I'm a big sap so I felt really bad for the little lizard who had never had the chance to even sell me a small insurance policy or live up to whatever potential a gecko might have. When I asked Amanda whether she wanted to consider getting another gecko or not she told me that what she'd really rather have was a ball python. Excuse me? A what? I don't think so! Then I remembered that earlier that week on the Today Show Matt, Meredith, Ann, and company had been talking to some expert about what a perfect pet corn snakes were and I sort of kind of suggested she look into those instead. Me and my big mouth. Let me introduce you to So laris the corn snake - latest resident of the Mouseski household and a true baby at only 2-4 months old. She's what's called a candy-cane corn snake due to her coloring though I rather doubt she'd be mistaken for a confectionary treat even if you found her hanging off of your Christmas tree or curled up at the bottom of your stocking! So, why are they called corn snakes? It's not because they eat corn ... no, no, no they eat very small rodents ... it's because they have a maize-like pattern on their bellies that resembles corn. At least that's what I've been told, I'm not about to turn her over and take a look for myself! Solaris here could grow to be between 4-6 feet long, live to be 20-25 years old, and has the genetic makeup to be an excellent escape artist so Amanda needs to make sure the top of her habitat stays on very, very securely unless she wants to hear me scream like a banshee and dance across the room faster than any celebrity who has ever appeared on Dancing with the Stars! I was kind of hoping that by the time Amy took Amanda over to the pet store last Thursday afternoon that she would have changed her mind about wanting a rodent-eating reptile that has the potential to scare her mother to death should she make like Houdini and pull off a great escape but alas, one of things that Amanda inherited from me is stubbornness and Solaris was all moved in by the time I came home from my vacation. That will teach me, won't it?! Hmm, that old saying wasn't "a snake in the hand is worth one in a tree", was it?? P.S., Evra and Verde still seem to be alive and well and living in the tree in their own habitat though I need to buy a new supply of crickets! Yep! You read that right - drive to Wakefield and get a tattoo or - in my case - drive to Wakefield and take pictures while your friends get tattoos! Somewhere during the course of our week in Matunuck, someone got the idea that it would be fun to go out and get some ink at one of the local establishments so on Friday morning Mags grabbed the local Yellow Pages (we had no internet so had to do it the old-fashioned way!) and looked up what shops were available in the local area. After calling around she decided on Marco's Tattoo on Charles Street in Wakefield because a) they were taking walk-ins and b) he was friendly on the phone! I'd be happy to give the man a link but he doesn't appear to have a website - something that just boggles my mind as he's a fantastic tattoo artist. He does have a MySpace page, though, so if you're curious you can go check that out here. While Kai and Claire checked out our local pub and the quality of the beer therein (! ), the rest of us piled in the van and made the short drive to Wakefield. 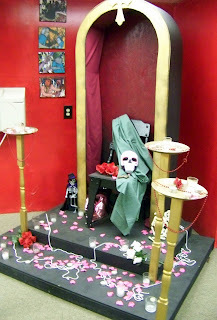 As soon as we walked through the door I knew immediately that Amanda would absolutely love the place as smack in the middle of the room was an anti-zombie altar (at least I think that's what it was!). Aaron, the proprietor of the place and tattoo artist extraordinaire, is apparently more than prepared if a zombie invasion ever hits Wakefield with three years' worth of provisions put away. I guess he's the one I should have asked that of in my I've Got a Question - You've Got an Answer post of July 30th! But, I digress ... there were three other people with me who actually were getting inked that day (or at least two of them were and one was thinking about renewing the ink she already had). Callie wasn't really sure what she wanted to get or where but after talking it over with Aaron he sketched out a Hawaiian flower for her that she liked and then after discussing color and location she went for it. I don't think I saw her flinch even once during the process so our Callie Ann is a pretty brave girl! It was the perfect tattoo for her, too as you'll see in the slideshow below! Next up was Mo who had decided that he wanted to have an Eye of Horus on his calf as it's an Egyptian symbol of protection and Mo feels very connected to Egypt, as anyone who has ever read his blog knows! Even though it was a big tattoo with a lot of black ink (which is the painful stuff! ), Mo handled it like a pro and the tattoo is absolutely perfect for him! 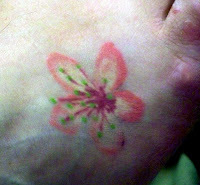 Lastly Mags asked about getting the tattoo pictured to the right that she already had on her foot touched up as the color had faded a lot since she originally had it done. As you can see, there was no black ink at all but Aaron explained to her that in order for a tattoo to work without shading, it needed to be about 50 feet big - much larger than the size of Mags' foot! He grabbed a ballpoint pen, sketched it in to show her what he meant, and immediately her tattoo looked a hundred times more vibrant. The man obviously knew his stuff! Mags agreed and after what was definitely a very painful process she emerged with a beautiful new tattoo that I'm sure she's going to love to show off. All in all, it was a fun afternoon/evening as watching one's friends get tattooed is pretty fun - especially when you're the official photographer and not having to worry about any residual pain later on yourself! As you can see, everyone still looked pretty happy by the end of the evening! Now I know I went out of sequence of days by jumping to Friday but this one was too fun to wait to do! Enjoy the slideshow and I'll be back with more tales from the Beach Vacation Crypt later on!! 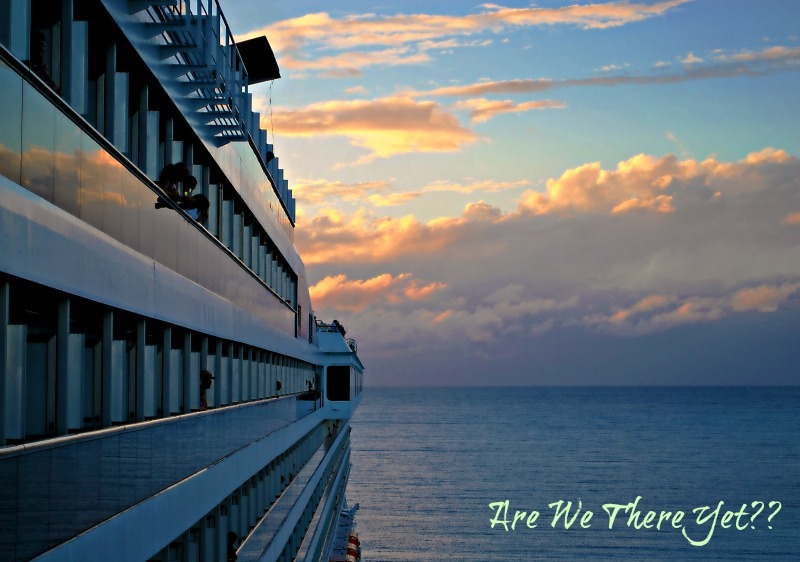 In trying to sum up last week's beach house vacation in Rhode Island with five other bloggers whom I've come to know and love, I'd like to borrow a phrase from one of my favorite books ever - Charles Dickens' classic novel A Tale of Two Cities - "it was the best of times ..." because it truly was. 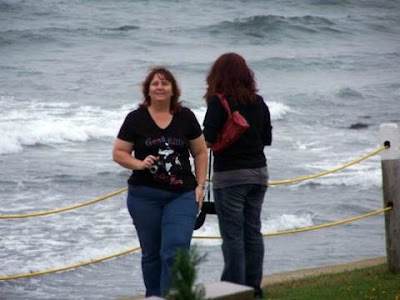 I know that a lot of people outside of the Blogosphere would no doubt think that it was sheer madness for a group of people who - for the most part - have never met to decide to spend a week together in a house by the shore; especially the Rhode Island shore for those who aren't aware of just how beautiful it is! However, I think that those of us who are part of the Blogosphere are quite aware of how lasting friendships can develop with people that we know only from their blogs even if we never have the chance to step off of the electronic page and into reality. Luckily I've had the chance to meet a lot of bloggers up close and personal and all of those that I've met so far have been just as warm, caring, friendly, funny, and fantastic in real life as they are via the Internet. The group I vacationed with last week were no exception to that rule at all - Callie, Claire, Kai, Mags, and Morgen. What a gang and what a week! I've decided that trying to share it all at once is just way too much of a task so instead I'm going to break it down by days as I've got way too many pictures to post and things to remember. Plus, as an added bonus to you folks, even though I tend to be way too prolific, I'm going to try to keep the writing down to a minimum and do most of this via slideshows - woohoo! Claire, Kai, and I arrived from Connecticut after stopping in at a local Rhode Island package store and farm stand along the way laden down with luggage, wine, beer, sweet corn, apples, and squash. Big hugs were given all the way around and then we settled into our home away from home for the week. Mags needed to go buy food for the week as she was doing virtually all of the cooking so she and Callie and Morgen piled into the van and headed off to the local Stop & Shop while Kai, Claire, and I made beds and unpacked. Unbeknownst to me, I was apparently supposed to go to the store with them so that decorations could be put up for a surprise birthday party but I tossed a monkey wrench in that plan when I volunteered to stay behind and make up the beds. Oops! Upon returning from the store laden down with enough groceries to feed a small army, Mags set to work preparing Mexican Night while Claire invited me to take a walk and check out our little beach town. I thought she was being friendly and wanted to spend some extra time with me but turns out that was the back-up plan to get me out of the house! What a sneaky little Brit she is! Still, we had a great walk and found a nice little group of rocks to sit by the water and watch the moon rise and the surf flow from. It was lovely and I would have been happy to sit there longer but Mags had told us what time dinner was going to be ready and we needed to head back. 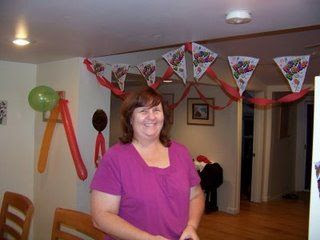 Imagine my surprise when I walked into a kitchen decorated with streamers and balloons and a big "Happy Birthday" sign on the refrigerator! I honestly had no clue as I thought the plan was to do a combined birthday celebration for everyone - not just me. Well, either that or I'm just clueless! It was such a lovely surprise and was made even more so when I was presented with a gift certificate to a lovely little spa in the Ledyard woods! Thank you so much again - all of you! After a fantastic dinner of fantastic Mexican food (I swear, Mags' chicken enchiladas are to die for and her cilantro rice - ¡Muy bueno! ), Mags brought out of the most delicious birthday cakes I've ever eaten. Of course it looked like it was going to catch the place on fire from all the candles so I wished that we'd have the best week ever before blowing them all out and setting off the smoke detector! Following cake we all retired to the deck with our beverage of choice to relax, chat, and get acquainted off of the electronic page. Sunday morning dawned with rain, clouds, and a rough surf but with the phenomenal breakfast that awaited us - who cared? Later in the afternoon when it had cleared up some we all piled in the van and drove over to Point Judith to feast on the best chowder and clam cakes on the East Coast before driving over to the Point Judith Coast Guard Station and checking out the lighthouse there. Because it was still overcast the foghorn was sounding while the beam from the lighthouse glowed in the mist and I couldn't help but try shooting a little video of the surf and the sounds. I got to capture a little piece of Claire's voice, too, as she walked up and began talking to me while I was filming! Another added bonus for those of you who are beginning to think she was a figment of our imagination! Upon returning to the beach house we played Scattergories and Guesstures and laughed ourselves silly before it was time for Callie, Mags, Kai, and Mo to watch Big Brother. Claire and I choose that time to take another walk which was really cool because it was misty and overcast and kind of eerie while we walked down the quiet roadways and discovered another hidden beach at the end of a dead-end road. 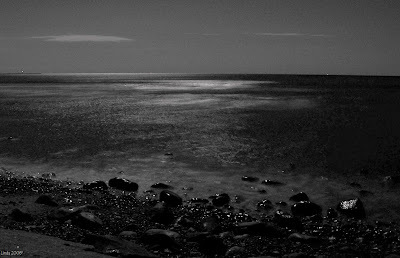 Eventually the moon began to peak through the clouds and it was just gorgeous being by the water, listening to the waves, and watching the clouds scud across the sky. Monday morning arrived with bright blue skies, blinding sunshine, and winds that could knock you over if you weren't careful! What a difference a day makes! The water in front of our house was full of surfers, windsurfers, fishermen, and all sorts of other people who had been nowhere in sight the day before! I took the opportunity to walk along the shore a little bit and take pictures - which you can find in the slideshow below. I also managed to get a nice sunburn on my face but it was a small price to pay for such a gorgeous day! Of course, at this point it would be really nice if my nose would kindly stop peeling! Oh dear, so much for not being prolific in this post ... yeesh! Claire's right, I couldn't write a short post if my life depended upon it! That said, this seems like a good point to end today's post; I don't want to overwhelm you with too much at once! Plus it's going to take me some time to get the next batch of pictures ready as I am apparently not able to take just a couple of pictures either ... I gotta learn some control! Enjoy the slideshow - more tomorrow! The bad thing about vacations is that they end. The good thing about vacations is that the memories can continue on long after you come home, especially if you took an awful lot of pictures! I know you guys are going to find this really hard to believe but I did take a lot of pictures and by that I mean a lot of pictures! It's going to take me awhile to get them all sorted out but in the meantime, I thought I would share a few before heading into work for another long 14-hour day. Like I said, the bad thing about vacations is that they end! The view from our deck through the sea grass and down to the beach. One of the locals stopped by to sit on the roof and visit for awhile! One of the fantastic sunsets over Matunuck Beach. The SouthEast Lighthouse on Block Island - very old and very beautiful! The top of the Pilgrim Monument at Provincetown, Cape Cod. Did I happen to mention that the sunsets were absolutely gorgeous?? This may sound strange but after last week, I now have a new-found love for the State of Rhode Island and I'm going to make it a point to get back over that way more often. Unfortunately, it won't be in the company of five fantastic people but I will take their memories with me when I go and have them there in spirit if not in body. Speaking of memories, I'll share some of them tomorrow when I have a day off and can collect my thoughts as well as put some more pictures together! You may not have ever thought so before but trust me - you're going to want to go to Rhode Island, too!